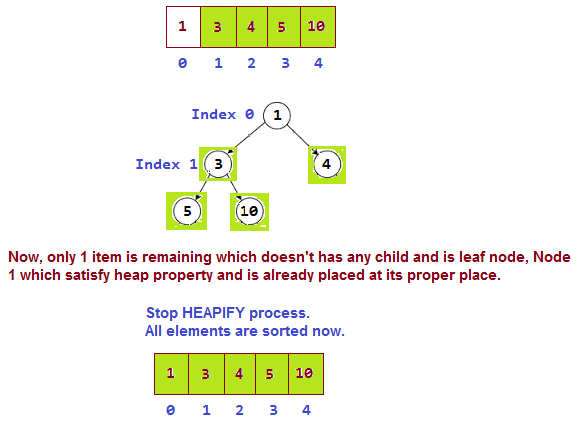 Before looking into Heap Sort, let's understand what is Heap and how it helps in sorting. 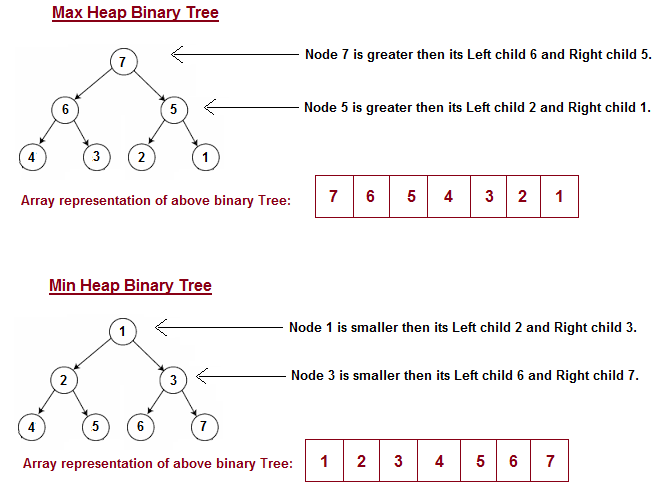 What is Complete Binary Tree? 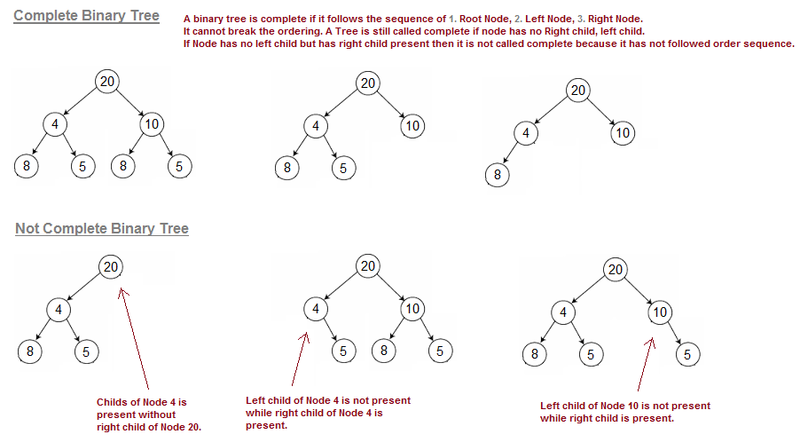 A Complete binary tree is a binary tree in which every node other than the leaves has two children. In complete binary tree at every level, except possibly the last, is completely filled, and all nodes are as far left as possible. 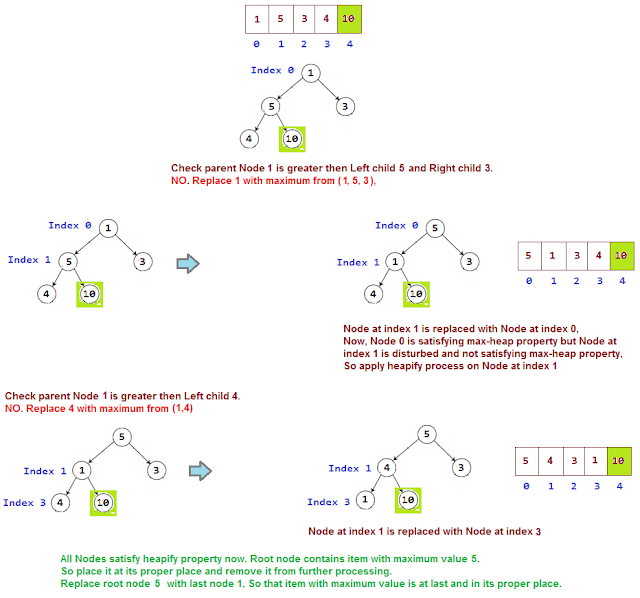 If a Binary Tree is filled level by level, left to right (Left child followed by Right child.) then it is called complete binary tree. If Right child is present without Left child then it is not complete. 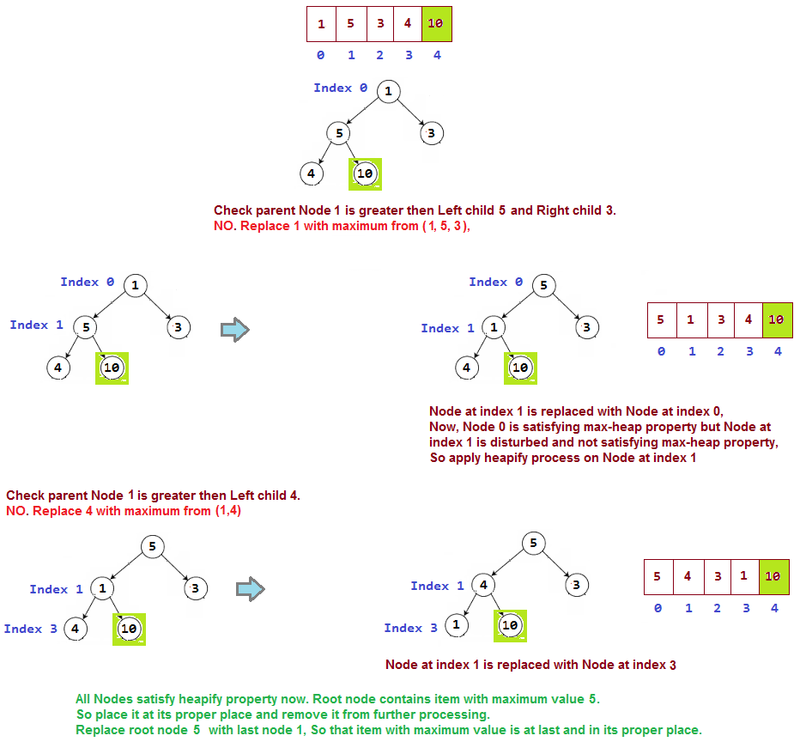 What is Heap property in Binary Tree? 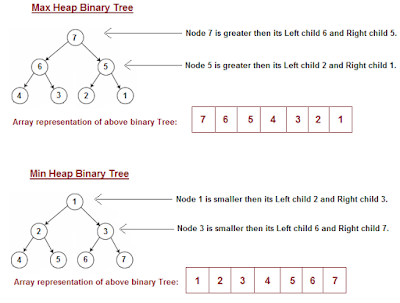 A binary Tree is said to follow a heap property if tree is complete binary tree and every element of the tree is Larger (or Smaller) than any of its descendants if they exists. Depending on the ordering, a heap is called a max-heap or a min-heap. 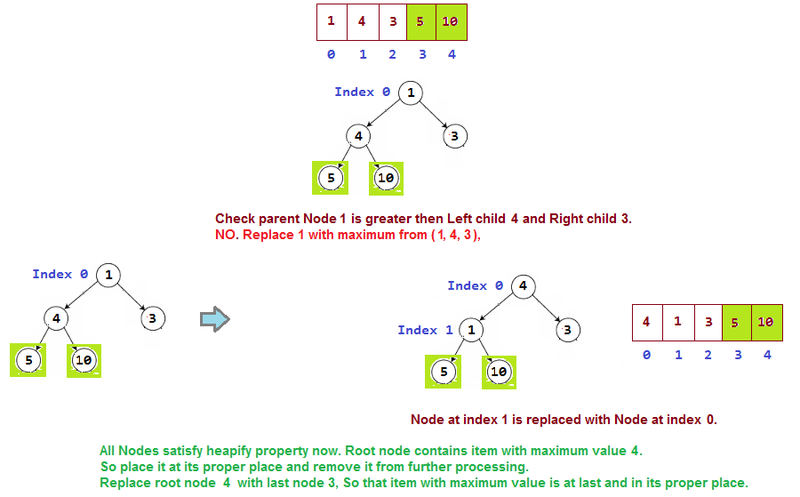 In a Max-heap, the keys of parent nodes are always greater than or equal to those of the children. 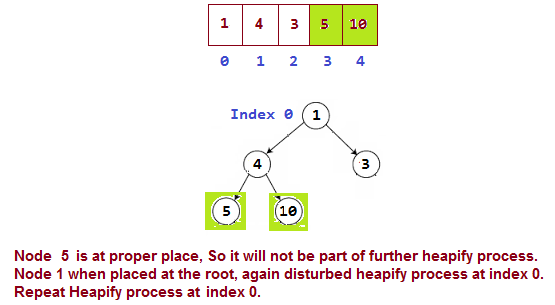 In max-heap, Largest element of the Tree is always at top(Root Node). In a Min-heap, the keys of parent nodes are less than or equal to those of the children. In min-heap, Smallest element of the Tree is always at top(Root Node). (start adding nodes from left to right) like shown below. 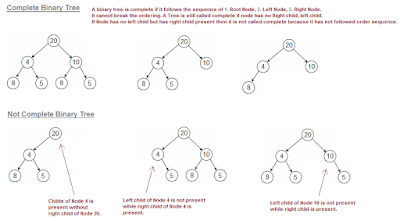 Each element has left and right child present in array except for leaf nodes, but how to find left and right child of non-leaf nodes in array. STEP 3: If the tree is satisfying Max-heap property, then largest item is stored at the root of the heap. After removing the largest element, which element will take its place? root, The new tree formed may or may not satisfy max-heap property. that it satisfies max-heap property. When tree satisfies max-heap property, again largest item is stored at the root of the heap. Heapify process checks whether item at parent nodes has larger value than its left and right child. If parent node is not largest compared to its left and right child, then it finds the largest item among parent, its left and right child and replaces largest with parent node. 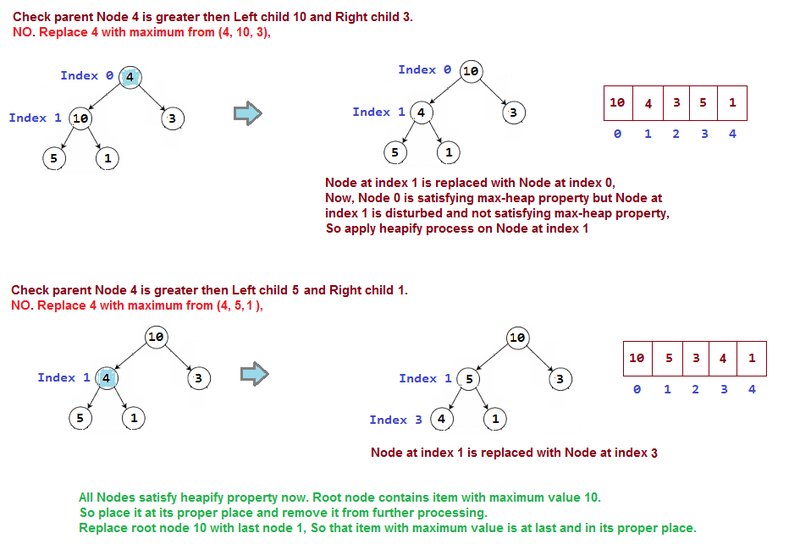 It repeat the process for each node and at one point tree will start satisfying max-heap property. At this point, stop heapify process and largest element will be at root node. Placing last node at the root may disturbed the max-heap property of root node. So again repeat the Heapify process for root node. 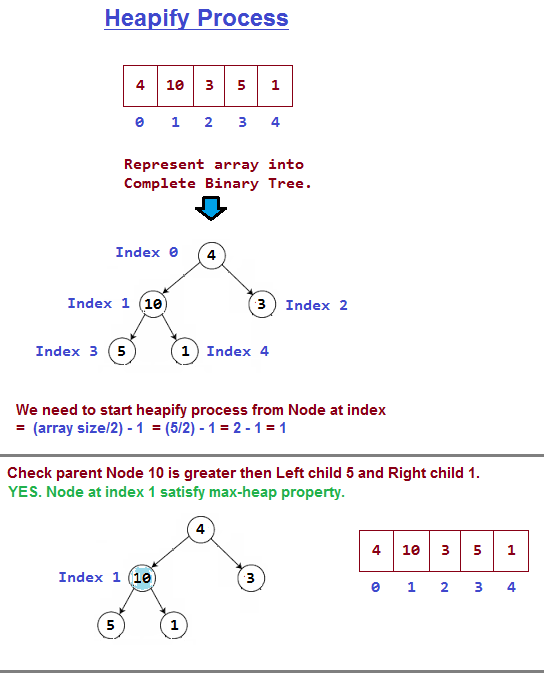 Continue heapify process until all nodes in tree satisfy max-heap property. Initially, From which node we will start heapify process? Do we need to check each and every node that they satisfy heap property? We do not have to look into leaf nodes as they don't have children and already satisfying max-heap property. So, we will start looking from the node which has at least one child present. How we will get that item in array, which has at least one child present? By using the formula (array.length/2) - 1, we will be able to get the index of the item to start Heapify process. Lets understand Heapify process with help of an example. //and decrease the size by 1 in next iteration as highest element is already at its place. //so calling max heapify for index 0 on the reduced heap size. 1. We build a heap(Max or Min) from the given array elements. 2. The root is the max (or min number). So extract it and put it in an array at its proper position. 3. Put last element at the root of the tree and Heapify the remaining elements. 4. Again extract the root and repeat heapification until there is one element in array. 1. Heap sort has the best possible worst case running time complexity of O(n Log n). 2. It doesn't need any extra storage and that makes it good for situations where array size is large. How ConcurrentHashMap works and ConcurrentHashMap interview questions. If you find any issue in post or face any error while implementing, Please comment. I'm Jayesh Patel, author of "JavaByPatel". I'm not a professional blogger but when time permits, love to share in-depth solutions to common Interview questions asked. How time complexity of Hashmap get() and put() operation is O(1)? Is it O(1) in any condition? What is Load factor and Rehashing in Hashmap?